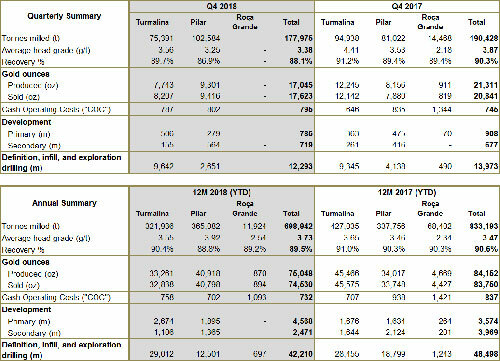 Jaguar Mining Reports Fourth Quarter and Full-Year 2018 Operating Results | Jaguar Mining Inc.
Toronto, February 14, 2019 – Jaguar Mining Inc. ("Jaguar" or the "Company") (TSX: JAG) today announced operating results for the fourth quarter ("Q4 2018") and financial year ("FY 2018") ended December 31, 2018. All figures are in US dollars, unless otherwise expressed. Financial results for Q4 2018 will be reported and filed on SEDAR on or before March 30, 2019. Ben Guenther, Interim President and Chief Executive Officer commented, "Production in the fourth quarter was disappointing and resulted in lower than anticipated gold production for 2018. Turmalina execution was below our expectations in Q4 and Pilar had lower grade and recoveries. At Turmalina, a new general manager and mine manager were appointed in October and technical staff were added during the quarter. The Turmalina mine lost 11 days of production from the higher grade production area to rehabilitate the mine ramp. Pilar is addressing the recent grade and recovery challenges." Mr. Guenther concluded, "In 2018 we did see an improvement in our cost performance and Pilar delivered strong production of over 40,000 ounces. Consolidated cash costs improved 14% to approximately $732 per ounce, in line with cost guidance reflecting a 34% decrease in cash costs at Pilar to approximately $702 per ounce. The new Turmalina management team is in place and energized as it implements the turnaround plan. Management and the Board are focused on addressing the issues at Turmalina and Pilar to stabilize our production profile. We are also prioritizing cost containment and operational execution across the organization to ensure continued lower costs and operating cash flow generation. We have made good progress on exploration initiatives to ensure sustainable production and expect to update our Mineral Reserves and Resources by the end of the first quarter of 2019." Jaguar Mining Inc. is a Canadian-listed junior gold mining, development, and exploration company operating in Brazil with two gold mining complexes and a large land package with significant upside exploration potential from mineral claims covering an area of approximately 64,000 hectares. The Company's principal operating assets are located in the Iron Quadrangle, a prolific greenstone belt in the state of Minas Gerais and include the Turmalina Gold Mine Complex and Caeté Mining Complex (Pilar Mine and Caeté Plant). The Company also owns the Paciência Gold Mine Complex, which has been on care and maintenance since 2012. The Roça Grande Mine has been on care and maintenance since April 2018. Additional information is available on the Company's website at www.jaguarmining.com. Certain statements in this news release constitute "forward-looking information" within the meaning of applicable Canadian securities legislation. Forward-looking statements and information are provided for the purpose of providing information about management's expectations and plans relating to the future. All of the forward-looking information made in this news release is qualified by the cautionary statements below and those made in our other filings with the securities regulators in Canada. Forward-looking information contained in forward-looking statements can be identified by the use of words such as "are expected," "is forecast," "is targeted," "approximately," "plans," "anticipates," "projects," "anticipates," "continue," "estimate," "believe" or variations of such words and phrases or statements that certain actions, events or results "may," "could," "would," "might," or "will" be taken, occur or be achieved. All statements, other than statements of historical fact, may be considered to be or include forward-looking information. This news release contains forward-looking information regarding, among other things, expected sales, production statistics, ore grades, tonnes milled, recovery rates, cash operating costs, definition/delineation drilling, the timing and amount of estimated future production, costs of production, capital expenditures, costs and timing of the development of projects and new deposits, success of exploration, development and mining activities, currency fluctuations, capital requirements, project studies, mine life extensions, restarting suspended or disrupted operations, continuous improvement initiatives, and resolution of pending litigation. The Company has made numerous assumptions with respect to forward-looking information contained herein, including, among other things, assumptions about the estimated timeline for the development of its mineral properties; the supply and demand for, and the level and volatility of the price of, gold; the accuracy of reserve and resource estimates and the assumptions on which the reserve and resource estimates are based; the receipt of necessary permits; market competition; ongoing relations with employees and impacted communities; political and legal developments in any jurisdiction in which the Company operates being consistent with its current expectations including, without limitation, the impact of any potential power rationing, tailings facility regulation, exploration and mine operating licenses and permits being obtained an renewed and/or there being adverse amendments to mining or other laws in Brazil and any changes to general business and economic conditions. Forward-looking information involves a number of known and unknown risks and uncertainties, including among others: the risk of Jaguar not meeting the forecast plans regarding its operations and financial performance; uncertainties with respect to the price of gold, labour disruptions, mechanical failures, increase in costs, environmental compliance and change in environmental legislation and regulation, weather delays and increased costs or production delays due to natural disasters, power disruptions, procurement and delivery of parts and supplies to the operations; uncertainties inherent to capital markets in general (including the sometimes volatile valuation of securities and an uncertain ability to raise new capital) and other risks inherent to the gold exploration, development and production industry, which, if incorrect, may cause actual results to differ materially from those anticipated by the Company and described herein. In addition, there are risks and hazards associated with the business of gold exploration, development, mining and production, including environmental hazards, tailings dam failures, industrial accidents and workplace safety problems, unusual or unexpected geological formations, pressures, cave-ins, flooding, chemical spills, procurement fraud and gold bullion thefts and losses (and the risk of inadequate insurance, or the inability to obtain insurance, to cover these risks). In addition, the Company's principal operations and mineral properties are located in Brazil and there are additional business and financial risks inherent in doing business in Brazil as compared to the United States or Canada. In Brazil, corruption represents a challenge requiring extra attention by those who conduct business there. Corruption does not only occur with the misuse of public, government or regulatory powers, it also can occur in a business's supplies, inputs and procurement functions (such as illicit rebates, kickbacks and dubious vendor relationships) as well as the inventory and product sales functions (such as inventory shrinkage or skimming). Employees as well as external parties (such as suppliers, distributors and contractors) have opportunities to commit theft, procurement fraud and other wrongs against the Company. While corruption, bribery and fraud and theft risks can never be fully eliminated, the Company reviews and implements controls to reduce the likelihood of these events occurring. The Company's present and future business operations face these risks. Accordingly, for all of the reasons above, readers should not place undue reliance on forward-looking information. Cash operating costs and cash operating cost per ounce are non-IFRS measures. In the gold mining industry, cash operating costs and cash operating costs per ounce are common performance measures but do not have any standardized meaning. Cash operating costs are derived from amounts included in the Consolidated Statements of Comprehensive Income (Loss) and include mine-site operating costs such as mining, processing and administration, as well as royalty expenses, but exclude depreciation, depletion, share-based payment expenses, and reclamation costs. Cash operating costs per ounce are based on ounces produced and are calculated by dividing cash operating costs by commercial gold ounces produced; US$ cash operating costs per ounce produced are derived from the cash operating costs per ounce produced translated using the average Brazilian Central Bank R$/US$ exchange rate. The Company discloses cash operating costs and cash operating costs per ounce, as it believes those measures provide valuable assistance to investors and analysts in evaluating the Company's operational performance and ability to generate cash flow. The most directly comparable measure prepared in accordance with IFRS is total production costs. 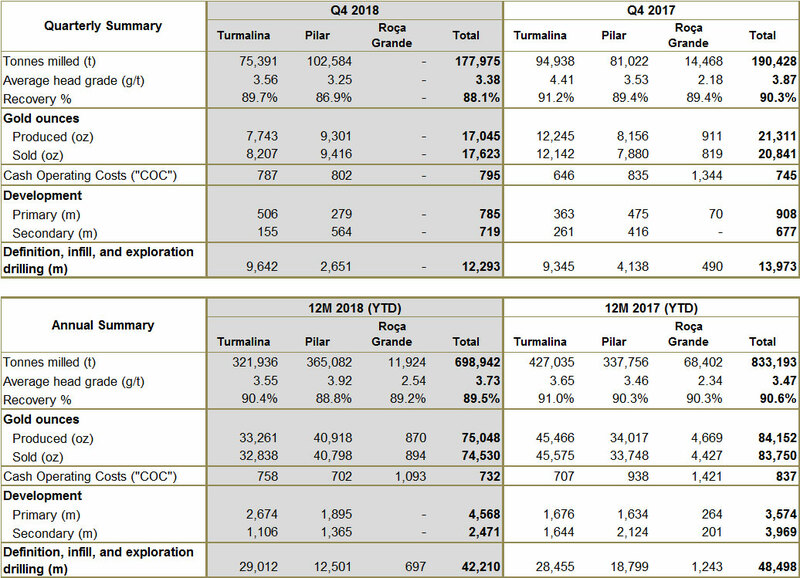 A reconciliation of cash operating costs per ounce to total production costs for the most recent reporting period, the quarter ended September 30, 2018, is set out in the Company's third quarter 2018 Management Discussion and Analysis (MD&A) filed on November 14, 2018 on SEDAR at www.sedar.com. All-in sustaining cost is a non-IFRS measure. This measure is intended to assist readers in evaluating the total costs of producing gold from current operations. While there is no standardized meaning across the industry for this measure, except for non-cash items the Company's definition conforms to the all-in sustaining cost definition as set out by the World Gold Council in its guidance note dated June 27, 2013. The Company defines all-in sustaining cost as the sum of production costs, sustaining capital (capital required to maintain current operations at existing levels), corporate general and administrative expenses, and in-mine exploration expenses. All-in sustaining cost excludes growth capital, reclamation cost accretion related to current operations, interest and other financing costs, and taxes. A reconciliation of all-in sustaining cost to total production costs for the most recent reporting period, the quarter ended September 30, 2018, is set out in the Company's third quarter 2018 MD&A filed on November 14, 2018 on SEDAR at www.sedar.com.